Submitted by mark on Sunday, September 16th, 2018 at 3:58 pm. The first of a series of community art workshops commemorating 125 years of women’s suffrage will begin at Alberton in Auckland on September 22. The workshop at this Mt Albert mansion will be led by Dunedin artist Janet de Wagt with support from Heritage New Zealand Pouhere Taonga, and is free to anybody who would like to take part. Participants will create a commemorative banner that will be joined with other banners made in other workshops at key heritage locations around the country over the next few months. The banners will be amalgamated into one final artwork and launched at Old Government Buildings in Wellington in April next year. “The banners are a reference to three Parliamentary petitions that were circulated around the country that resulted in women finally being granted the right to vote on 19 September 1893,” says the Manager of Alberton, Rendell McIntosh. One of the petitions, which was circulated in 1893, includes the signatures of Sophia Louisa Taylor – the owner of Alberton – and her daughter Winifred. “It’s very appropriate that the workshop is taking place at Alberton,” says Rendell. Sophia Taylor supported the franchise movement for the practical reason that if women had to obey laws and pay taxes like men, surely they also deserved the vote. 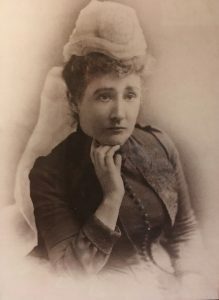 Like many other socially prominent women, she also supported the Auckland Tailoresses Union. “The petition that Sophia and Winifred signed was described by suffragist Kate Sheppard as a “monster petition” consisting of petition sheets circulated throughout New Zealand, and returned to Christchurch where Sheppard pasted each sheet end on end and rolled it around a section of a broom handle,” says Rendell. The roll was presented to Parliament with great drama. Sir John Hall, Member of Parliament and suffrage supporter, brought it into the House and unrolled it down the central aisle of the debating chamber until it hit the end wall with a thud. “The banners will be an artistic representation of that extraordinary social movement that ultimately saw New Zealand becoming the first country in the world to grant women the right to vote,” he says. Artistic ability is not necessary for people to take part in the workshops – and Janet de Wagt is looking forward to working with a range of different ideas and skills. Alberton will also be hosting a Suffragists Tea on September 22 and 23 which, he says, is another good reason to come along and take part. The tea will include a plum cake made from Sophia’s recipe by Marist College students (tea or coffee $6 per person, or $10 to view the house). “Participants will be able to use painting, printing, stamping, drawing and weaving – whatever they prefer – to create the banners,” he says.